Are you having a busy day, and wondering what is next on your Calendar agenda? Maybe you forgot when that appointment is tomorrow? Or perhaps you’re wondering if you’re free next Tuesday for a meeting at a specific time? You can ask Siri to tell you, utilizing the virtual assistant as a little personal assistant on your iPhone, iPad, or Mac. 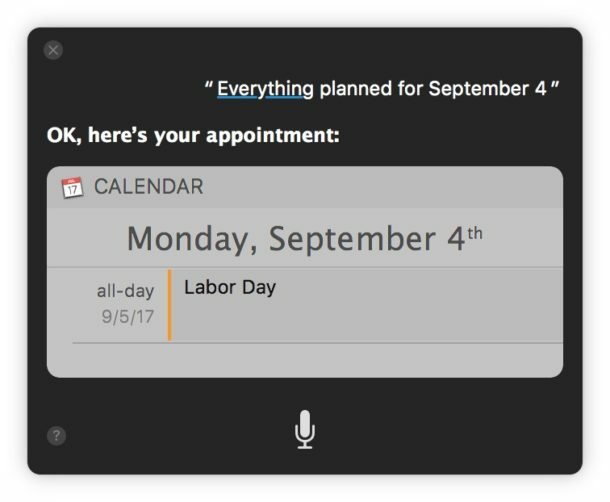 Interacting with Calendar using Siri is one my favorite set of Siri command tricks, and if you get into the habit of using it this way it may become one of yours too. The Calendar on iPhone, Mac, and iPad is one of the most useful features of iOS and Mac for anyone who is maintaining a busy lifestyle or a lot of appointments and meetings, whether work, personal, or both, and combined with Siri the Calendar is even better since you can request all sorts of information with the digital assistant. Siri has full access to your Calendar and any events, so if you want Siri to tell you what’s coming up on your calendar or if you have a meeting today, tomorrow, or several years from now, just ask. All of these Siri commands work on any device with Siri, whether it’s an iPhone, iPad, or Mac. What’s on my calendar today? What’s on my calendar tomorrow? What’s on my calendar this week? What’s on my calendar next week? What am I doing next week at 4pm? What’s coming up on my calendar? Do I have anything planned for September 4? What’s on my calendar in December of 2021? When is my meeting with Bob? 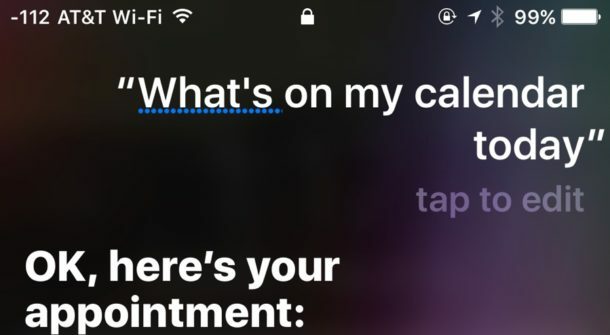 Siri will scan your calendars, including shared calendars, and report back any findings, if you use broader questions that have larger time spans Siri will even provide a little calendar embedded into the response. If nothing is found that pertains to the question asked then a response something like “you have no appointments on that day” or “I didn’t find any appointments for today” will arrive instead. And yes, if you show holidays on the Calendar then those will appear on the calendar requests from Siri too. 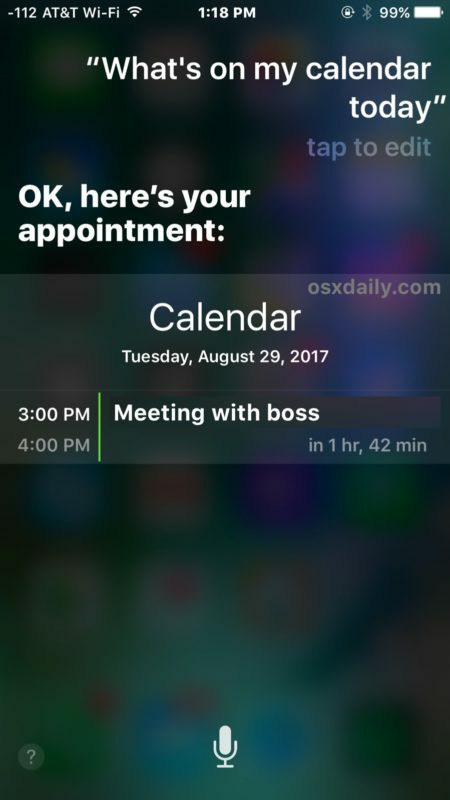 Of course you can also add and modify calendar events, meetings, and dates using Siri too, with commands like “set up a meeting for 10am with Bob”, “make a new appointment next Friday at 4pm”, “reschedule my meeting with Bob from 3pm to 4pm” or “cancel todays appointment” and many other variations. The Calendar and Siri work fantastic together, so give them a try. If you enjoyed this, you might also like to see a giant list of Siri commands or browse through our wide collection of Siri tips here.